More than 1,000 students and staff at Dominica’s Ross University School of Medicine are heading for the waters off St. Kitts where the cruise liner GNV Excellent will be moored as the temporary location of the college. 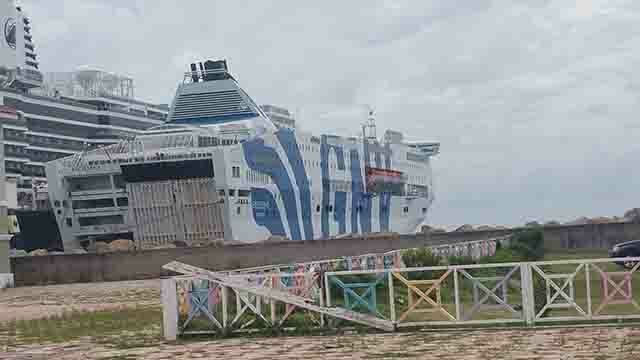 The federal Cabinet of St. Kitts and Nevis has given the go ahead to the Adtalem Global Education Inc. to have the cruise liner used as a temporary floating campus to house staff and students of the School of Medicine for the coming months. All of the school’s students and staff were displaced following the passage of hurricane Maria that devastated Dominica and had to be evacuated from that island. According to a post Cabinet Breifing last Friday, two senior officials of Adtalem Global Education Inc. met with the Cabinet to finalize the preparations for the temporary relocation to St. Kitts and Nevis of the Ross University School of Medicine, which suffered severe damage during the passage of Hurricane Maria. An official statement read: “Mr. Carey James, Associate Dean of Operations, Analysis, and Admissions, and Mr. Veron Lake, Director of Civic Affairs and Security Projects, discussed the temporary relocation…. off the waters of the Federation of St. Kitts and Nevis up until mid-January 2018,” the statement read. The Cabinet also disclosed that that meeting, the Adtalem officials had previously met with the St. Christopher Air & Sea Ports Authority (SCASPA), the Ministry of National Security, the Solid Waste Management Corporation, the Customs and Excise Department, and the Ministry of Health. The individuals who are set to attend school and work on the floating campus began arriving in the Federation last week and the spill over economic effects are set to be significant. Some of the faculty and staff are actually expected to take up residencies on land while they will be based on the ship. The GNV Excellent is presently docked at Port Zante and it is expected to anchor off the shore of St. Kitts on busy cruise ship days in a designated area. The floating campus is expected to be in the Federation until early next year.